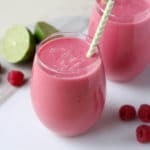 This Raspberry Lime Smoothie is a fun combination of ingredients that creates a refreshing and flavourful smoothie that can be used for breakfast and snacks alike. I’m not a huge smoothie person, to be honest, I never really got into the smoothie craze. Don’t get me wrong, I do like them, but I don’t really consider them a meal, more of a refreshing drink or snack. The reason is simple; they don’t really fill me up. I know a lot of people use them as a quick breakfast idea, and I do often recommend them to my clients as a healthy breakfast option, they are just not my particular go-to meal idea. I think one of the things to keep in mind when it comes to nutrition is that what works for one person might not work for another, and that’s totally ok. With all of that being said, I certainly still do enjoy smoothies from time to time, and this particular flavour combination is one of my favourites. Although it might seem a little odd to add lime to a smoothie, it adds so much flavour! 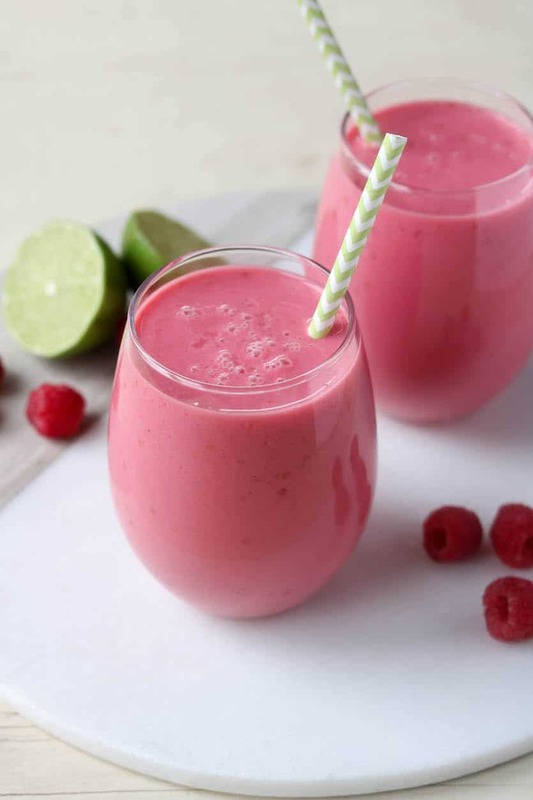 I made this Raspberry Lime Smoothie with almond milk, but I think coconut milk would work equally well, and the inclusion of the full-fat yogurt helps to provide some much-needed protein to this drink to help balance your blood sugar and keep you fuller for a longer period of time. I used almond milk in this recipe, but any type of non-dairy milk would work equally well. Add all ingredients to the blender and process on high until smooth. Split into two glasses to serve. The first look of this Smoothie is made me oww, It’s looks so nice & yummy, I gonna make this recipe today in my home, thank you so much for this article!